The arms of a bear, wearable by a human. The bear arms are equipment used (unsurprisingly) on the arms. While bear arms do not literally give the wearer the strength of a bear, they do improve the wearers combat skills in two ways. First, the arms do include a nasty set of bear claws, which increase damage for each attack. The second combat advantage is that wearing the arms will make the heroine feel larger and tougher than she really is, due to being made to feel like a bear. Frequently, the heroine will growl and snarl in an ursine manner. Spurred on by the feeling of having tapped into the power of the bear, the ferocity of her attacks increases, and causes fear (or derisive laughter) in the opponent. A man with bear arms. The original pair of bear arms were owned by a heroine in the days of yore, her name lost to history. 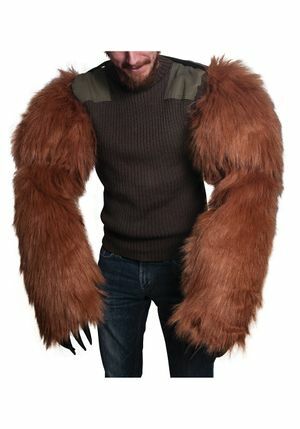 This original set was so renowned, it was mentioned in the Godville Constitution, noting the curious fact that this set of bear arms had no left arm. The enshrinement of the concept into the Godville Constitution intrigued many a craftsman, until some attempted to recreate them (although with the now-standard left- and right-arm set). Bear arms are very simple to use. The user simply slips them on over her own arms, like sleeves. The paws at the end of each arm fit the hand like a glove. 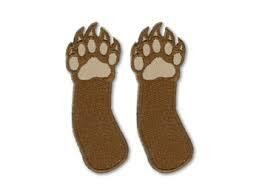 Wearing the bear arms not only gives the aforementioned combat advantages, it also affords the wearer a certain amount of protection from damage on attacks to the arms, due to the thick skin and fur. A well-made set of bear arms can last the heroine several weeks of regular use, but will eventually require some repair work to patch up any holes and sharpen the claws. This can be accomplished through divine intervention in the form of encouragement or miracle, or by defeating a monster with the "smith" prefix. Protects wearer's arms from damage. Very sweaty in warm weather. Increased potential for flea infestation. ↑ The famous "Right Two Bear Arms." ↑ Literally, not figuratively or metaphorically. This page was last edited on 2 February 2019, at 04:05.